Restored Switchback, one of 22. 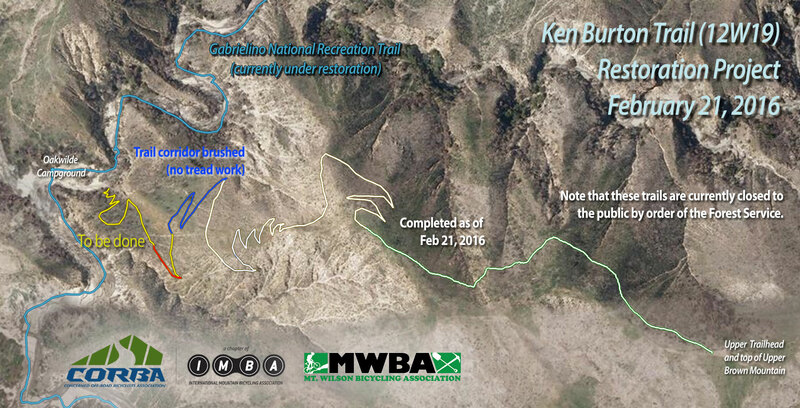 On Sunday, February 7, MWBA hosted a trailwork day on Ken Burton trail. With 16 volunteers, we cleared an additional .18 miles of trail. Heavy winds and dry Santa Ana conditions prevented us from using all our power tools, so progress was slower than previous days. With volunteer help from professional trailbuilder Hans Kiefer of Bellfree Contractors, three large drainages were made more sustainable using rock retaining walls, rock armoring and lots of sweat! Using rock collected on site saved the crew from having to haul in additional materials for wire basket structures. 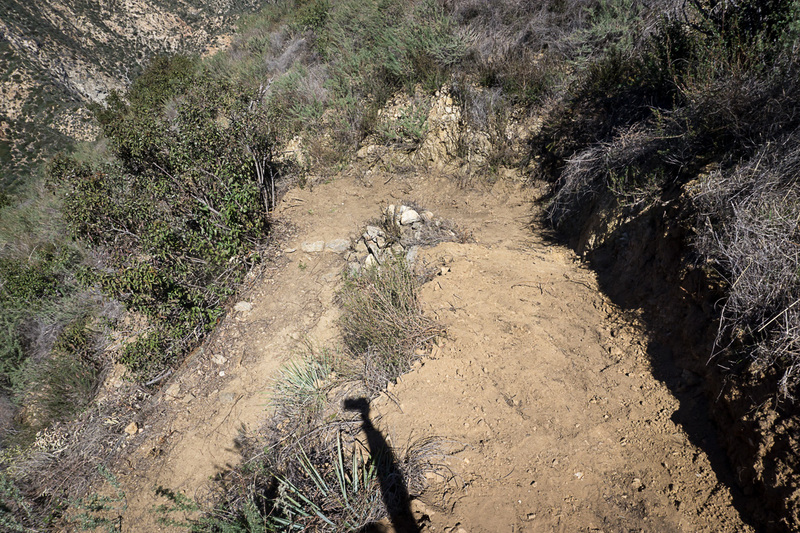 The crew restored several switchbacks, added drainage, and brushed and cleared an additional quarter mile of trail. On Sunday, February 21st, we had fourteen volunteers come out to continue restoration efforts. 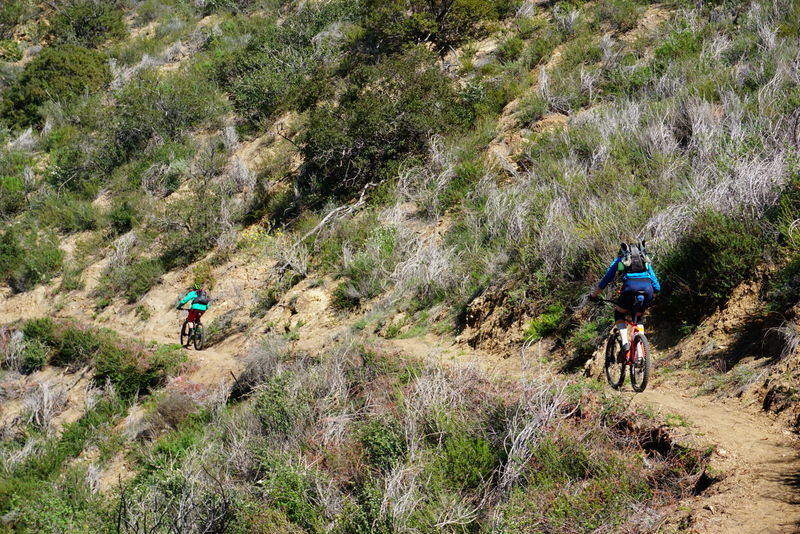 The group rode to the end of upper Brown Mountain fire road, then continued down the already-completed section of the trail. 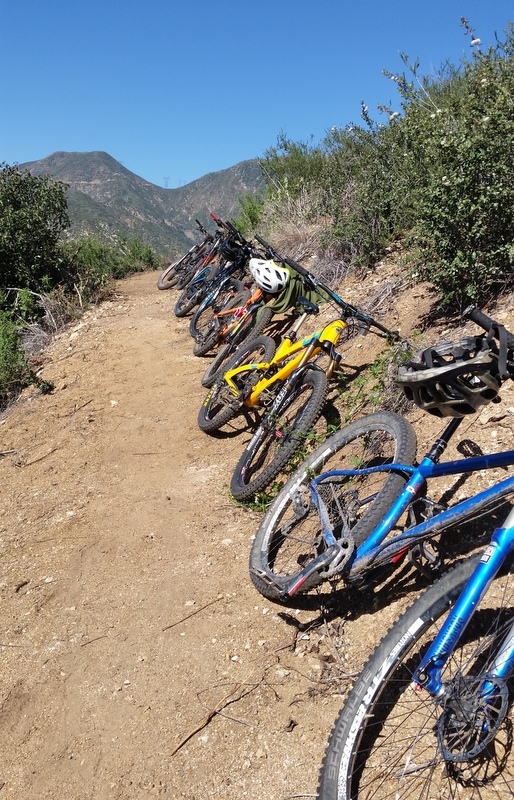 Bikes were left at a convenient point, below which it would have been a strenuous climb to ride back out, especially after working on the trail. We hiked down the rest of the way to the work site. Mitch (MWBA) and Mike McGuire were able to brush an additional .19 miles of trail with the powered tools. As we get down to lower elevations, the brush is getting much thicker, taking more time and effort to clear. The rest of the crew concentrated on outsloping, drainage and re-establishing tread on approximately .14 miles of trail. The total work day included approximately .33 miles of trailwork. The last third of a mile of the trail will require chainsaws to clear the many fallen oak trees. Steve Messer, CORBA president and trail crew leader, flagged out the last half mile based on GPS tracks of the trail before the fire. Ken Burton passed through a beautiful shaded oak grove before dropping down to the Gabrielino trail and Oakwilde Campground. Sadly, many of those oaks were killed and have fallen across what was the trail. Brush has grown into this relatively flat section of trail, and will require extensive chainsaw work to clear. We plan to go in with the CORBA/MWBA sawyer crew (USFS certified chainsaw operator volunteers) to clear those trees before the next scheduled trailwork day. With over 1000 volunteer hours, ten workdays, and several additional prep days by CORBA and MWBA trail crew leaders, we have so far completed or brushed approximately 1.8 miles of the 2.25 mile trail. What’s left is less than a half mile, including extensive chainsaw work. Weather permitting, we’ll be back out there on March 13, 2016. 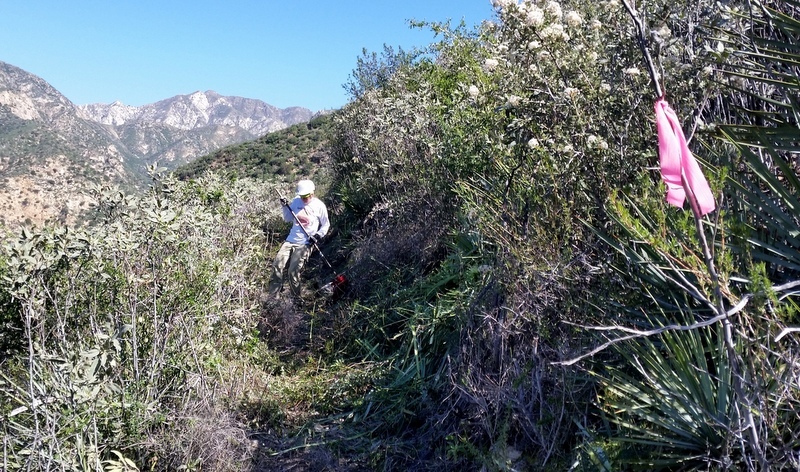 This entry was posted on Tuesday, February 23rd, 2016 at 3:45 pm and is filed under Angeles National Forest, San Gabriel Mountains, Trail Building and Restoration, Trail Crew. You can follow any responses to this entry through the RSS 2.0 feed. You can leave a response, or trackback from your own site.